The 4155Y is a Kaby Lake, so essentially what an i3 used to be. Dual Core 4 threads. So there you have it folks, 8" 1200x800 EMR with a refreshed Atom and Win10 compatibility, for all your on-the-go ClipStudio and OneNote needs. Nice! I'd like to see someone put this through it's paces. We'll have to wait before this is easily available here in the states. I'm looking forward to Andromeda, and hoping that it may essentially replace my phone while doing everything my AVTN8 used to do at the same time. I went to see the Surface Go in person, it's still a much larger device. But somehow even numbers say it's heavier, it felt lighter than my VTN8. Dude, the raytrektab DG-D08IWP is exactly what I'm looking for. One cravat though - I use the CS6 (or CS2 for low powered machines) suite to avoid paying Adobe subscription fees. Does anyone know if second gen EMR tech is comparable with CS6? Hopefully this and the pen support on the I-Pad Mini will motivate OEMs to take another look at Windows penable 8 inch devices. Is there anything on this in English anywhere? Probably not. But if you have some concrete question I might be able to find some answer for you on Japanese web sites. Akiba has published a good primer to the tablet in English, but almost all info seems to coming from watching Japanese user reviews and checking the raytrek twitter feed. By the way they seem to have launched a white "Siro" version (same spec) and a 10" version (Celeron N4100 / 8GB DDR4 / 128GB SSD) last year, so the company at least seems alive and healthy. 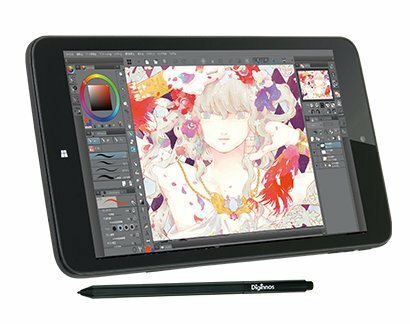 I love how the Japanese artists will give the 8-10" tablet market a chance, unlike the West.